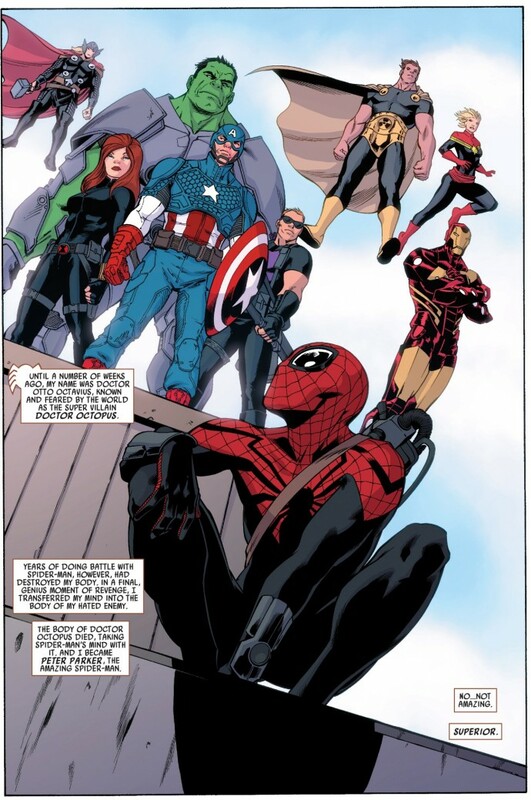 As the song goes, “meet the new boss, same as the old boss.” Superior Spider-Man Team-Up #1 may be promoted by Marvel as the “debut” issue of a new ongoing title, but the differences between this book and its predecessor, Avenging Spider-Man, are as superficial as it gets. The writer, Chris Yost, is the same and illustrator David Lopez provided pencils on the last issue of Avenging, so it’s not even like the look and feel of this comic are any different. So what’s the deal with Marvel trying to spin this series as something new? I know this isn’t anything I should be all that bothered by, but for some reason, the general “same-ness” of Superior Team-Up and Avenging distracted me to the point that it cut into my enjoyment of the comic. The plot focuses on Spider-Man attacking his fellow Avengers without any provocation which leads Yost to bring up the “probation” order that was placed on Spider Ock earlier this year when other heroes in the Marvel universe first noticed the Web Slinger was acting a little weird. As it turns out, Spider Ock is totally justified in his behavior as his teammates have been affected with a variation of the Carrion virus, which then leads to the reveal of a certain Spidey villain who looks poised to be this specific title’s antagonist. But the comic reads very much like an introduction – so much so that I almost got the sense that Yost was trying to sell the whole Superior concept to readers for the first time. 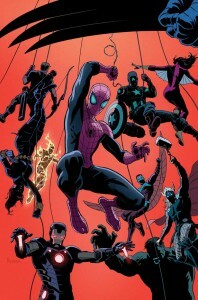 I understand that the repackaging of this comic series was done as a tie-in to the larger “Superior Spider Month” promotion for July, but the hand-holding by the creative team in Team-Up just feels like an insult to readers who have been on-board with the Superior status quo since it was first introduced in December/January. As was my issue with how Marvel ended its Age of Ultron mini-series recently, there’s a fine line between trying to get more readers to buy your comic books, and selling out your story in favor of one big giant commercial. You accomplish the former with good writing, excellent artwork and some kind of hook or cliffhanger that keeps people coming back for more. 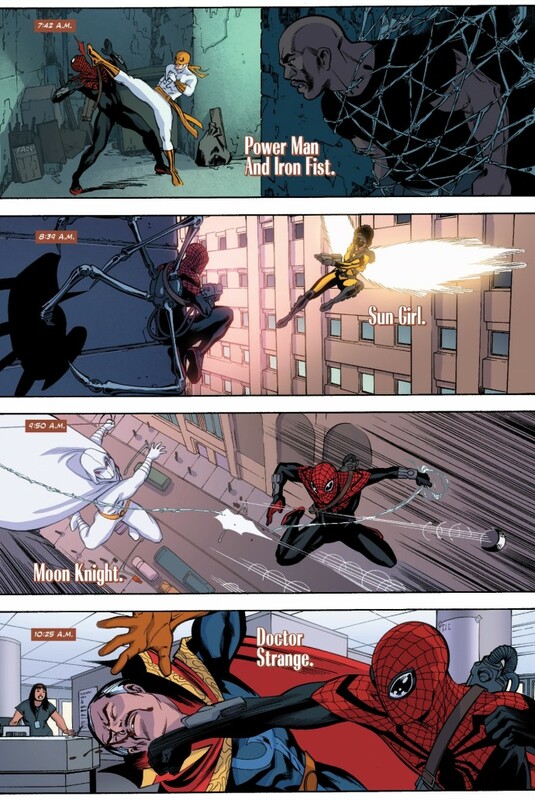 Superior Spider-Man Team-Up #1 has none of that. Yost tells the same kind of story he’s been telling since January and the comic functions more as one big commercial for me to go out and buy all of the other Spider-Man titles this month because … well, Marvel is telling me to. I imagine I would be far more engaged by this comic if Marvel just skipped the pedestrian introductions all together, continued on with Avenging with issue #23 and went forward with the Kaine/Jackal story that Marvel already has promoted in its August solicitations. The Spider Ock/Kaine meet-up is actually a comic book storyline that I think has some potential juice to it, especially since Kaine MURDERED Doc Ock years ago during the infancy of the “Clone Saga.” And with October solicitations talking about a storyline that involves the “return of Doctor Octopus” I wonder if the presence of the Jackal, the kind of clones, is going to have some kind of long-term ramifications on Spider Ock and the ruse he’s been playing on the Marvel Universe. That’s the kind of intrigue that makes me want to buy comic books, not what I got out of Superior Team-Up #1. What exactly was accomplished in this “inaugural issue?” We know the new Spider-Man is a jerk. We also know that the rest of the Marvel Universe – including “Earth’s Mightiest Heroes” in the Avengers – is hopelessly oblivious and idiotic about Spidey’s dramatic change in personality. Spider Ock doesn’t even seem to be trying to lay low and not arouse suspicion any more, and outside of a passing comment from Captain America or Black Widow, the Avengers seem either hopelessly unable or disinterested in addressing what’s wrong with their teammate. And what annoys me most about this (non) plot point is it is being done strictly out of the convenience to serve the overall “Superior” status quo rather than just good old-fashioned storytelling. I can only suspend disbelief for so long and if Dan Slott, Yost and others in Marvel’s bullpen/hierarchy want to maintain the superior-era for the long-haul, they would do themselves a huge favor if they kept him far away from the Avengers and others who should be able to see through Otto’s chicanery very quickly. 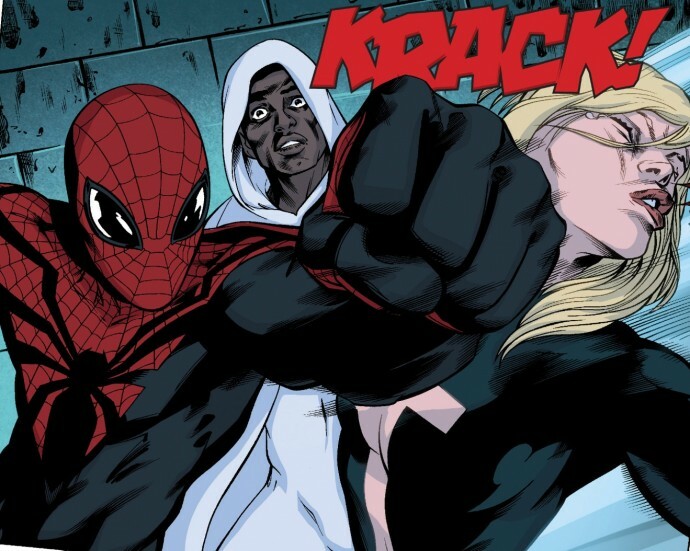 Similar to my biggest gripe with Superior Spider-Man #14 last week, Spider Ock should NOT be this dominant. It’s boring and uninteresting to read about. Furthermore, it makes me question how this character was ever able to be defeated by Spider-Man and other Marvel heroes back in his days as Doc Ock. As my podcast partner Dan Gvozden mentioned in episode 5 of our Superior Spider-Talk podcast, Superior Otto has an answer for everything and is playing chess while everyone else in this universe is playing checkers. Doc Ock was NEVER this masterful and any attempt to argue otherwise from the powers that be is revisionist history. That leaves us with what is perhaps the weakest entry in the Superior Spider-Month promotion (yes, even weaker than the Morbius two-parter). We have a comic book that is being promoted as something “new” that’s anything but – all the way down to the same ending we’ve seen 4-5 times before in this series, which is Otto gathering up his old Sinister Six buddies (I guess he grabbed the Vulture about finishing things up in the raft in Superior #13). The prologue involving the Jackal is the only new wrinkle. Let’s just pretend this comic book didn’t happen and get ready for the Kaine/Scarlet Spider crossover coming later this month. Never in a million years did I suspect I would be having some nostalgia for the “Clone Saga” but I guess the strong rewrite Yost has done for Kaine combined with my overall frustration with everything “superior” right now is changing some very long-term prejudices of mine. I do agree that everything is coming easlily to Otto. I think Slott has this all planned out where he wins until the Green Goblin rises and knocks him down a few notches. Even still, I enjoyed Superior Spider-Man #14, mainly for Ramos’ terrific art and the whole badass feel it had to it. Yeah, I know you’re mystified by my tolerance for that Morbius story, but at least the creators there tried to actually create a story, instead of an origin issue for a character that’s only 6 months old and has been rebooted 114 times already since his debut. Superior Team-Up was just a pathetic sales ploy by Marvel to get the Avenging comic a bump in sales with a #1 issue. That to me is far more offensive to my sensibilities than writing some new characters and situations and just not sticking the landing. Did they really try? I know you haven’t been reading the series, but that arc totally goes against the status quo that Keatinge (half-assed) set up in the issue before and the whole thing was uninspired too. I’m not one of those hypocritical people who gives everything I read 1 web for one little thing, but I really didn’t like that story. If it was run in the actual Superior title and not Morbius, I would grade it the same.